New Impatiens Beacon bred by PanAmerican Seed® and distributed in the UK by Ball Colegrave, offers high resistance to Plasmopara obducens, the cause of Impatiens downy mildew. Ball Colegrave is thrilled to re-launch Impatiens to the UK horticultural industry. Since the widespread outbreak of impatiens downy mildew some years ago, many growers and retailers hesitated to stock this key bedding plant and home gardeners have been mourning the loss of a much loved garden favourite. Now, through devoted breeding efforts and collaboration that has spanned the globe, our sister breeding company PanAmerican Seed has developed Beacon™ a new impatiens that is highly resistant to downy mildew. “Growers, retailers and home gardeners have been waiting for the chance to bring impatiens back…without the risk”, says Sandy Shepherd, Ball Colegrave MD. “Plant structure, flowering time and flower size is similar to existing Impatiens series, so Beacon™ is easy to incorporate into production planning, says Stuart Lowen, Ball Colegrave Marketing Manager. “There’s no special plant culture required for Beacon™ to be successful. 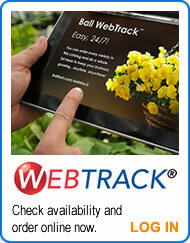 So, for lasting colour in the garden, you can rely on Beacon™ to thrive”. In the spirit of bringing light – and happiness – back to gardens all over the world, a donation of a portion of Beacon™ Impatiens global sales will be made to The OI Foundation. This is a less-widely known charitable organization which sets out to improve the quality of life for those living with osteogenesis imperfecta (OI), a genetic bone disorder characterized by fragile bones that break easily, also known as brittle bone disease. Beacon™ Impatiens will have its UK debut at the 2019 Ball Colegrave Summer Showcase (July 15th to August 2nd). There are currently 6 core colours; Bright Red, Coral, Orange, Salmon, Violet Shades, White and a mix in the series. A limited supply is available now, with full availability in January 2020. Please contact your sales representative for details. Ball Colegrave, owned by Ball Horticultural Company, is a leading distributor of seed and plant products to the UK ornamental bedding industry. Ball Colegrave has introduced many innovative, award-winning products to the horticultural industry, including the Wave® Petunia, Sorbet™ Viola, Cool Wave™ Trailing Pansy and Kabloom™ Calibrachoa. The company rigorously trials all plant varieties on its own trial grounds and prides itself on its innovation, service and support to the whole ornamentals industry. Visit www.ballcolegrave.co.uk for more information. PanAmerican Seed, owned by Ball Horticultural Company, is an internationally renowned breeder and producer of seed-raised flowers and vegetables based in West Chicago, IL, that produces high-quality and best-performing varieties. Research facilities in North and South America, the Pacific Rim and Europe enable us to test and evaluate new varieties under numerous climate conditions. Our state-of-the-art seed distribution center guarantees quick, efficient processing of orders for our worldwide customers. Visit www.panamseed.com for more information.